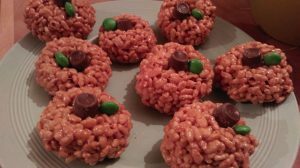 Marshmallow Pumpkins – Create, Make & Bake! These were probably one of the best thing on the table last Halloween, although I think I used a bit too much oil. Perfect for children to have a go at as no baking is required. 1. Microwave the marshmallow and butter and mix them together, add the orange food colouring to make make a nice orange liquid. 2. Mix in the Rice Krispies and roll them into medium-sized balls, making sure to coat your hand in oil so it doesnt stick too much. 3. Place on plate and decorate using the Rolos and M&M’s. Enjoy!